LRWC is gravely concerned about the escalation of widespread and systematic violence and human rights violations against Rohingya people in Myanmar. Human rights violations against the Rohingya are well known to have persisted for many years. In September 2017, the UN High Commissioner for Human Rights and UN Secretary General referred to the escalation of violence by police, military and security forces against the Rohingya since 25 August 2017 as “ethnic cleansing.” In 2014, the UN Special Rapporteur on Myanmar stated that the abuses “may constitute crimes against humanity as defined under the Rome Statute of the International Criminal Court.” International non-governmental organizations have been raising the alarm about possible crimes against humanity and ethnic cleansing against the Rohingya people in Myanmar since 2013. Since 2015, some legal analyses have suggested the possible intention of Myanmar authorities to destroy the Rohingya people in Rakhine State. LRWC is deeply concerned about the plight of Rohingya refugees fleeing to Bangladesh, Thailand, India and Malaysia, none of which have ratified the UN Refugee Convention. There is alarm about urgent need to ensure and protect the rights and wellbeing of refugees, including children, women and men in Bangladesh, India, Thailand and Malaysia, and worry about the possibility of Rohingya being involuntarily returned to conditions of indefinite detention, torture or ill-treatment in Myanmar in violation of customary international law (CIL). All investigations, efforts and recommendations of Mr. Rae, Canada and all other States must be guided by international human rights law and informed by the root causes of violations and by the historical, regional and legal contexts. For several years, human rights organizations including LRWC, have engaged in advocacy seeking an end to the widespread and grave human rights abuses by security, police and armed forces against Rohingya and other minority peoples in Myanmar. In response to the dramatic escalation of violence against Rohingya people since 25 August 2017, LRWC has called for the immediate adoption of the recommendations in the Advisory Commission on Rakhine State and unimpeded access by the UN Independent, International Fact-Finding Mission (FFM). LRWC has made statements to the United Nations (UN) Human Rights Council (HRC) and written letters to the Myanmar government and other governments including Canada. Myanmar’s refusal to allow access to the FFM is part of a longstanding pattern of failure by Myanmar to allow independent monitoring of human rights violations in Myanmar. Instead, there is a pattern of judicial harassment of human rights defenders and journalists reporting human rights violations. LRWC and otherinternational human rights monitors have called upon the Myanmar government to halt all harassment of human rights defenders including human rights monitors and journalists and to adhere to the UN Declaration on Human Rights Defenders. Systematic judicial harassment of defenders is compounded by corruption within Myanmar’s justice system. uphold the Universal Declaration of Human Rights, all multilateral human rights treaty obligations, and customary international law. adhere to international human rights law in the treatment of Rohingya refugees. Zeid Ra’ad Al Hussein, United Nations High Commissioner for Human Rights, “Darker and more dangerous: High Commissioner updates the Human Rights Council on human rights issues in 40 countries,” Opening Statement, Human Rights Council 36th session, 11 September 2017, available at: http://www.ohchr.org/EN/NewsEvents/Pages/DisplayNews.aspx?NewsID=22041; Press Conference by Secretary-General António Guterres at United Nations Headquarters, 13 September 2017, available at: https://www.un.org/press/en/2017/sgsm18676.doc.htm. UN Human Rights Council, Report of the Special Rapporteur on the situation of human rights in Myanmar, 2 April 2014, A/HRC/25/64, at para 51, available at: http://www.ohchr.org/EN/HRBodies/HRC/RegularSessions/Session25/Documents/A-HRC-25-64_en.doc. See e.g. 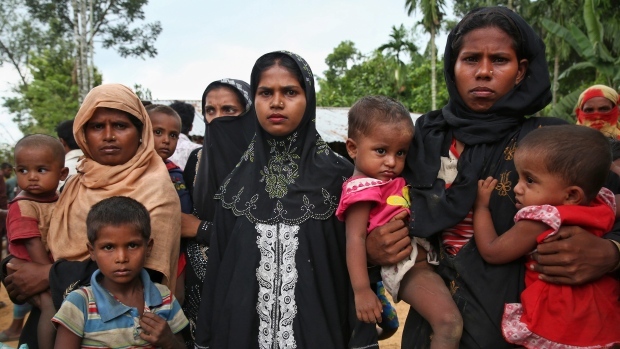 Human Rights Watch, “All You Can Do is Pray”: Crimes Against Humanity and Ethnic Cleansing of Rohingya Muslims in Burma’s Arakan State, April 22, 2013 https://www.hrw.org/report/2013/04/22/all-you-can-do-pray/crimes-against-humanity-and-ethnic-cleansing-rohingya-muslims. UN General Assembly, Convention Relating to the Status of Refugees, 28 July 1951, United Nations, Treaty Series, vol. 189, p. 137, available at: http://www.refworld.org/docid/3be01b964.html. Of ASEAN states, only Philippines and Cambodia have ratified this treaty. IRIN, Bangladesh resists greater UNHCR role in Rohingya crisis, 23 October 2017, available at: http://www.irinnews.org/news/2017/10/23/bangladesh-resists-greater-unhcr-role-rohingya-crisis; Amnesty International, Myanmar / Bangladesh: Rohingya refugees must not be forced home to abuse and discrimination, 4 October 2017, available at: https://www.amnesty.org/en/latest/news/2017/10/myanmar-bangladesh-rohingya-refugees-must-not-be-forced-home-to-abuses-and-discrimination/. Human Rights Watch, India Can’t Mistreat Refugees By Not Signing Refugee Convention: Customary International Law Prohibits Returning Rohingya to Burma, 24 September 2017, available at: https://www.hrw.org/news/2017/09/24/india-cant-mistreat-refugees-not-signing-refugee-convention; Amnesty International, Thailand is failing to fulfill its obligation to protect refugees,” September 2017, available at https://www.amnesty.org/en/latest/news/2017/09/refugees-in-thailand-forcibly-returned-to-danger/; Audrey Gaughran, Amnesty International’s Director of Global Issues, “Rohingya Fleeing Myanmar Face Difficulties in Thailand,” The Diplomat, 29 September 2017, available at: https://thediplomat.com/2017/09/rohingya-fleeing-myanmar-face-difficulties-in-thailand/; Josh Hong, Rohingya issue shines spotlight on Malaysia’s refugee policies, Asia Times, 26 September 2917, available at: http://www.atimes.com/rohingya-issue-shines-spotlight-malaysias-refugee-policies/. Justin Trudeau, Prime Minister of Canada, Prime Minister appoints the Honourable Bob Rae as Special Envoy to Myanmar, 23 October 2017, https://pm.gc.ca/eng/news/2017/10/23/prime-minister-appoints-honourable-bob-rae-special-envoy-myanmar.